Time-2-Tri-Fitness.co.uk offer bespoke training and coaching programmes which are you-centric, based around your goals, your work and your life factors. In order to maximise your potential I will combine the latest scientific methodology and my own experience gained over 20+ years of representative level sport. 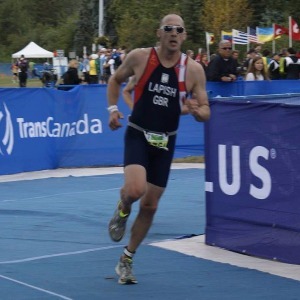 James Lapish is a British Triathlon Level 2 Coach and a level 2 Open Water Swimming Coach He is also a Level 3 Nutrition and Personal Trainer, Level 2 instructor in Gym, Kettlebells, Circuits and TRX. James is the Founder and Coach at Time-2-Tri-Fitness where he coaches athletes of all abilities from GBR age groupers to first timers. As a Personal Trainer James has amassed a wealth of experience dealing with and coaching all levels of ability, skill sets and fitness levels in his 20+ years in The Royal Air Force and is a passionate believer that “one size doesn’t fit all” when it comes to personal training. However, a bespoke programme taking into account your goals, your work and your life factors will pay dividends! James has successfully coached athletes to "Celtman" blue t-shirts and provided strength and conditioning training to a National Level swimmer. He is currently coaching newcomers to 10KM road races, Half Marathon, Marathon and Ultra Marathon runners, beginner to Kona qualifying Triathletes from sprint to Ironman and budding cyclists throughout the UK, Europe and Australia. James has represented the Great Britain Triathlon Team in the Age Group Sprint Distance Race in the World Championships Grand Final and the European Championships. He has also gained representative honours at Rugby Union and Rugby league in the past. Success. Coach James Lapish has been notified of your message.